I just came downstairs to this scene and felt the need to document it for posterity! 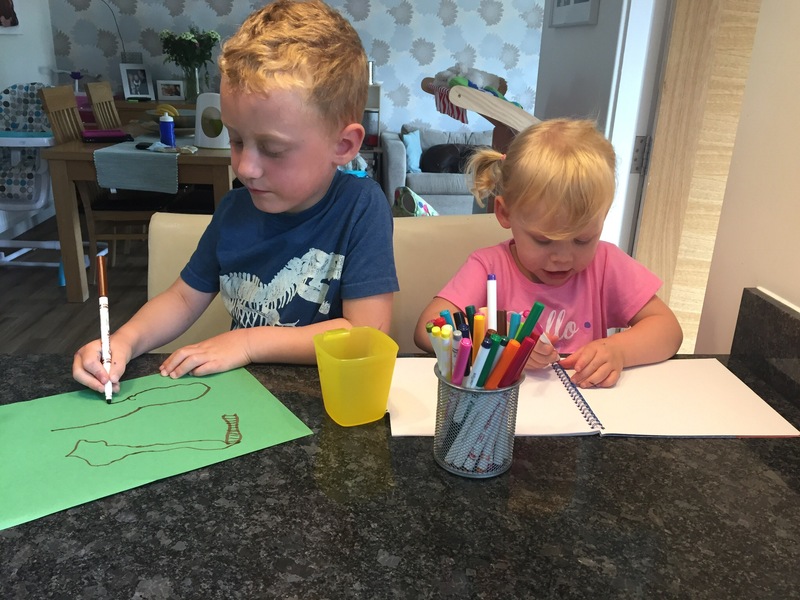 Completely unsupervised or unprompted, the big two were sat next to each other, drawing and colouring-in and chatting to each other during a rare moment of beautiful sibling harmony. I had to pinch myself! I suspected for a moment I’d either slipped into a parallel universe (where the calm and compliant children I’d ordered had accidentally been delivered!) or I was actually sleep walking and it was all a dream I was going to be woken up from once the usual screaming and shouting at each other recommenced! The more likely reality as the moment is that every time you walk through our front door, you get front row tickets to a boxing match; these moments of harmony are few and very far between! I feel like the Rocky soundtrack should be playing in the background while the kids act out a training montage wearing sweat bands and jogging up and down the stairs! Eye of the Tiger is pounding out in the background while they take jabs and generally rip lumps out of each other while battling over Every! Little! Bloody! Thing! In the other blue corner is Esme AKA The Tenacious Terrier! (yes I know it’s confusing that they are in the same coloured corner but when I tried to put her in the red corner she said ‘Red was poo poo, George always got to go in the Blue one and it wasn’t even fair’ whilst trying to forcibly remove her brother using her teeth!!) Do not mistake her smaller size to be a disadvantage- she is feisty and tenacious and scrappy and will fight to the death! Special moves include ‘the Angry Gouge’ and the ‘scratch and grab!’ Underestimate her at your peril- I’ve seen her chase boys twice her age and size and the look of fear on their faces is genuine, necessary and entirely warranted! There are only 18 and a half months between George and Esme; George doesn’t remember a time when his little sister wasn’t here and there are times when they are incredibly close and cute together. They can be really generous and thoughtful with each other; if I go to the shop with one of them and let them get a treat, they will insist that they need to pick something for their sibling as well. When George comes downstairs in the morning, he always brings toys down and makes sure he also brings something for Esme and Ted. Esme really misses George when he’s at school and asks about ten times after lunch if it’s time to pick ‘Georgy’ up yet?! They have moments when they play really nicely together and seem to genuinely enjoy each other’s company. They are usually far more conciliatory if they are doing something I disapprove of or making a mess together! They also get on better when there are other children here- it’s as if they need diluting with others! But we seem to spend more and more of our time dealing with sibling battles! Some days I feel like a UN peace negotiator who is basically doing a really bad job and ends up having to stand between scrapping children when the conflict resolution has broken down for the millionth time! It usually comes to some kind of physical altercation at least 2 or 3 times a day and that’s just in the few hours left of the day after I’ve picked George up from school! They argue about whose ‘turn’ it is! We are expected to keep track of approximately a billion things in terms of who picked the last thing they watched on TV and who sat on the left hand side of the car last and who got to have the last ‘Edward cuddle’ and who sat on mummy’s knee for the story last night. Woe betide you if you get the turn taking wrong! Letting George pick the Topsy and Tim that we watch when it was Esme’s turn to chose will ruin her entire life! They are incapable of sharing and constantly want whatever the other one has! The number of times I’ve completely reached the end of my tether and threatened to bin whatever it is they are arguing about has reached the millions! They always want whatever the other one has- it could be an empty carrier bag; if George is the one holding it then it suddenly becomes life-threateningly important that Esme has it too! They are unbelievably short tempered with each other in a way that they do not demonstrate with anyone else. They both resort to the ‘punch or grab or kick first and ask questions later’ school of thought! They snap at each other and any disagreement leads to them both screaming and shouting. Both demonstrate much more restraint with everyone else; they both have lovely friendships with kids at school and nursery and are both kind and share and I’ve never been called in for ‘the talk’ where the teacher tells you your child has been a brat and bitten or punched or grabbed someone’s else’s! Their angry, shouty, sometimes violent outbursts seem to be saved up for their sibling alone! I get that sharing is hard. I get that being almost 4 and 5 is complex and tiring and means life is tricky. I know that my time is at a premium when there are three of them vying for it and sharing access to a grown up that you love and want attention from is challenging. But in a house with more toys than you could count, its so frustrating that they come to blows over one thing that they both ‘have to have’. It drives me mad that they both do things or say things for the sole purpose of winding each other up! It drives me to distraction that they wait for their brother or sister to start talking to me in the car and then talk over them and try their hardest to make the other one cross! The shouting is driving me mad! I’m patient! It’s one of my few positive character traits!! It takes a lot to wind me up but this constant bickering is driving me crazy!!! I’m reassured to know that it is not just us- I know siblings squabbling is part of growing up but seriously… If I hear one more time about the bloody blue bowl and whose turn it is to sit on the good chair I may actually spontaneously combust! Is this life until one of them moves out or will they grow out of it?!?!?! Never mind Doodle chasing and frightening boys twice her age, I’m 21x older than her and I definitely know my place! Reading this and I could honestly say it sounds like your talking about my boys. I be e 3 of them, 7, almost 5 and almost 4. And the younger 2 are Exactly like yours. The minute they open their eyes they fight about whose turn it is to lie on the left side of my bed, or whose turn it is to go down the stairs first. The youngest is at nursery and when he’s home alone he is the most carefree happy boy. The minute I say let’s go fetch your brothers from school. He turns. And once we actually have his brother the fights arguments hitting kicking and nastiness starts. I know they will grow out of this stage. But I’m hoping it’s sooner rather than the year they both decide to leave home. Here’s to us mums that put up with way more than we should. All for the love of our children.